Boiled frosting is a very light and fluffy topping used for cake or cupcakes. It is made without any type of fat added. Its ingredients are boiled until reaching a soft ball stage and then slowly mixed into beaten egg whites until the frosting is light and fluffy. It is mostly used as an overall frosting layer that can be spread smoothly over the surface of the cake or cupcakes, or it can be given a simple frosting design such as swirls or peaks. It can be used for some basic piping, such as borders or writing. Because it is light and fluffy, and can be slightly sticky after it sets for a while, it is a little harder to work with when trying to decorate a cake with a detailed design. There are many different recipes available for boiled frosting. 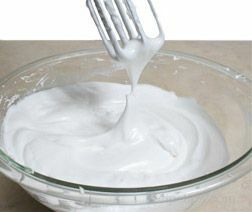 Some boiled frosting recipes are sticky and set up fairly quick so you need to spread it soon after it is made, but the recipe below remains very workable and is easy to spread on the cake. Remove the eggs from the refrigerator so they will be room temperature when ready to use. In a small heavy saucepan, combine the sugar, cream of tartar, and salt. Stir the mixture to combine evenly; add the water. Over medium heat, bring the mixture to a boil, stir continuously until it is clear. 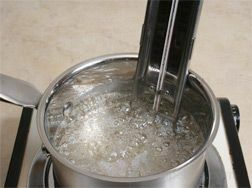 Allow the mixture to boil until it reaches the soft ball stage or 240°F on a candy thermometer. Remove from the heat and allow it to set while beating the egg whites. Beat the egg whites in a large, wide bowl until they form soft peaks. 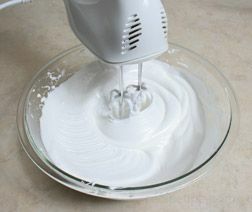 Be sure to use a wide bowl so that you have enough room to beat the frosting while you are adding in the sugar mixture without pouring it into the beaters. Once the eggs are at a soft peak, begin to slowly pour the boiled sugar mixture into the egg whites Pour the mixture along the side of the bowl while beating the two together. Make sure to pour the sugar mixture in a slow steady stream off to one side and continue to beat the frosting the entire time. Do not pour the sugar mixture into the beaters. 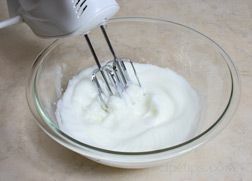 To incorporate it into the egg whites, move the beaters back and forth into the area where the sugar mixture has been added. Once all of the sugar mixture has been added, pour in the almond extract. Beat until the frosting is thick enough to form stiff peaks. If you have trouble getting the frosting thick enough to form stiff peaks, you can add a little powdered sugar to help it thicken. Start by only adding a tablespoon at a time. Beat in well and check for stiff peaks again before adding more powdered sugar. Once the frosting has thickened to form stiff peaks you can begin frosting the cake. Note: Because this frosting is so light and fluffy, detailed decorating patterns should be avoided. The ripple, swirl, and peak patterns are three designs that work well with this frosting. See the tips below on how to store boiled frosting. 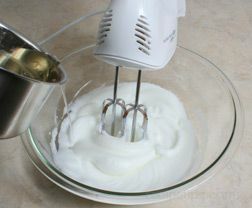 This fluffy white frosting is best when used as soon as it is made, but if necessary it can be stored for a day. When storing the frosting, be sure to cover it tightly; and then refrigerate. If it is not stored airtight it will begin to set. Once the boiled frosting has been spread on the cake, it can be stored at room temperature, but refrigerating it will help keep the frosting soft and fluffy longer. Cover the cake with a domed cake server or a large container that is deep and wide enough to not disturb the frosting when placed over the cake. Freezing boiled frosting is not recommended.